isn't the power to weight ratio calculated at the flywheel and not the wheels? Yeah its calculated at the flywheel, not wheels. hey guyz i just want to know can i drive a standard vl calais turbo on my p'z i dnt understand much bout this power to weight stuff? If you get your License after July 1st you cannot drive ANY CAR that is Turbo/Supercharger/High Performance. ON NUMBER 2. I have my l's now so im clear of that but get my p's in September so after july does that mean i need to start using the log book? Or is it for ppl that get their l's after that date.? i only JUST got my licence in time. feel bad for all the L platers but thems the breaks! Last edited by misk; 27-06-07 at 12:14.
i got my p's in jan of this year.. so basically i have to drive a vlt thats under 125kw per tonne.. is that alot? because i was looking to get a calais vlt in a few months.. so lets say i get one with rb30et engine, rebuilt turbo, 3" exhaust, pwr trans cooler, hybrid front mount intercooler, etc etc.. does that sound like it would be more then the 125kw per tonne? xtc_jet - You can drive anything on your L's because technically the fully licenced driver next to you is in control of the car! anyone know about my situation? shi/t cause it effects me right afta i brought my vl turbo... ill try get an exemption lol say i need it for work to tow a trailer or sum bull**** lol. 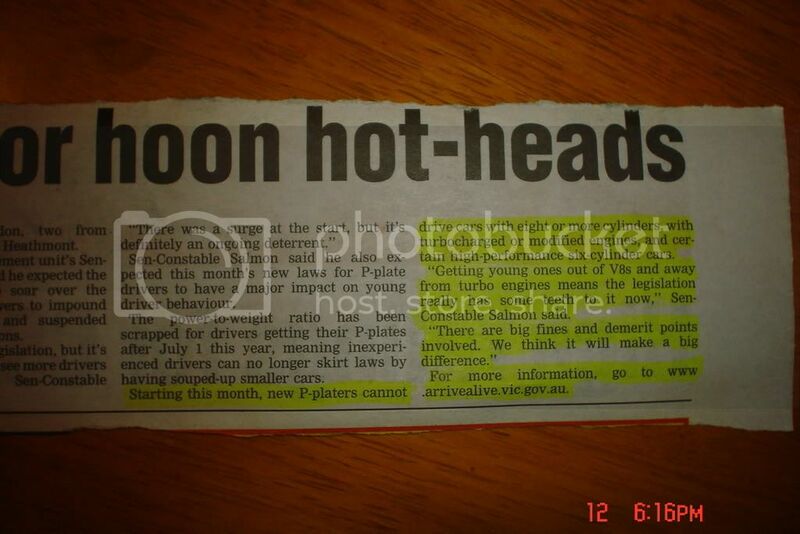 (if it didnt work) the newspaper says " starting this month, new p-platers cannot drive cars with 8 or more cylinders, with turbocharged or modified engines, and cirtain high performance 6 cylinder cars. "getting young ones out of V8s and away from turbo engines means the legislation really has some teeth to it now," senior constable Salmon said.
" there are big fines and demerit points involved. We think it will make a big difference." For more info, go to www.arivealive.vic.gov.au"
**** cause it effects me right afta i brought my vl turbo.... ill try get an exemption lol say i need it for work to tow a trailer or sum **** lol. These laws have been advertised for at least 6 months if not a year so by what ur saying im guessing you just handt heard about them until recently! LANCE - cops dont carry a dyno around in their back pocket so you just go by the stock power of the vlt! im sure u woulda been well aware of all the confusion about wen the rules come in or not and i thought that i was fine until july 1st 2008.
do i have to do that 120 hour shat? i owwn a vlt aswell so this means i cant drive it blody bs ! i be aloud to drive that on my Ls ???? i was told the other day by a police officer that after the 1 of july 2007 you are unable to drive any modified car.. ie even a pod would get u in trouble.